Especially during the hot summer months, it is important to keep your dog hydrated in order to prevent heat stroke. If you are out on a long walk or are spending some extended time at the dog park, however, you may not have access to clean water for your dog. In situations like these a dog water bottle is just the trick! 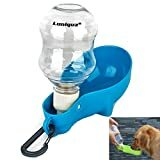 These water bottles are specially designed for use by dogs in that they come with a detachable drinking bowl or container that you can fill with water from the bottle and offer to your dog. Water bottles for dogs come in a variety of sizes and styles which makes it easy to find a model that suits you and your pooch perfectly. What dog water bottles are available? Water bottles for dogs come in a variety of shapes and sizes depending on the brand manufacturing the product. Many bottles are made from tough, durable materials like stainless steel or plastic which ensures that they last throughout the entire summer. 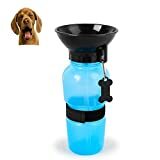 The most common design for dog water bottles is one that incorporates a drinking bowl into the lid - you simply unscrew the lid and pour water from the bottle into the bowl for your dog to drink. 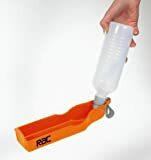 Other bottles utilize a fold-up design, having a bottle that detaches from a plastic bowl that can be folded up for storage. Some companies offer additional features and accessories for their dog water bottles such as insulating pouches, carrying slings or straps and metal clips. 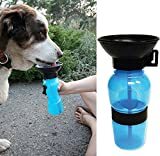 Because there are so many options in water bottles for dogs you can shop around until you find the perfect model to fit your needs. While you could bring an ordinary water bottle along while taking your dog on a walk, you may also need to pack a bowl from which your dog can drink. Water bottles for dogs eliminate the need for packing a separate bowl because many of them have a water dish incorporated into the lid. These water bottles are very portable and do not take up any more space in a tote bag or backpack than a traditional water bottle. Some models even include a shoulder strap or clip so you can attach the bottle to your belt or to the outside of a backpack. Water bottles for dogs come in a variety of sizes to fit your needs - bring along a mini bottle for short trips to the grocery store or pack a large bottle for a day at the beach. The best part about water bottles for dogs is that they can easily be refilled from a water fountain or tap when you come across one. The summer is the perfect season to spend some quality time with your dog outdoors, as long as you keep your dog well hydrated. Whether you are taking a trip to the beach or are simply going down the street to the park, never travel without a water source for your dog. 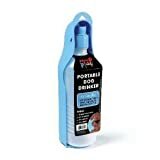 Water bottles for dogs are a simple, portable solution for dog owners on the go who like to take their dogs with them.